Plastic Soldier Review - "Civilization"
Home > Features > "Civilization"
Civilization is another of the breed of board games that sprung from successful computer games. As with Age of Mythology, this one was developed by Eagle Games, and the box promises us no less than 784 detailed plastic miniature pieces, many of whom are clearly figures. Great, but what exactly do you get, and are they worth having? The game revolves around a familiar theme of naturing various aspects of your civilisation as time passes to build it up and dominate the rest. There are four eras: Ancient, Medieval, Gunpowder/Industrial and Modern. Each era has a small number of military units associated with it. The foot figure in this era is perhaps more Roman than anything else, but it largely defies any historic label. He wears a sort of crested hood and a cuirass with a seam down the chest that has a number of fasteners across it. He has some sort of a skirt (mail?) and a small apron, and carries a large round Greek-like shield. Greaves round off the ensemble, and he is armed with what appears to be a carrot. Well, perhaps its a sword, but it looks more like a carrot to us. His mounted companion is moulded as one with his horse, so there is very little detail on his body. He too defies any placement in history, but perhaps with such a blank canvas to work on a particular paint job can make him into any one of dozens of different cavalry types. One feature that there is no getting away from, however, is that he is very short. 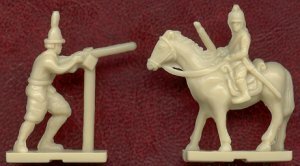 The infantryman is a respectable 23mm tall, but the cavalryman struggles to reach 20mm. Here the foot figure is described as a man-at-arms. He wears an enormously simplified armour and some sort of hooped skirt which parts at the front. As before then, nothing in particular but indicative of the period, which of course is all he was ever meant to be. The mounted man appears to be in full armour and he wears a small cape. His shield is well undersized and triangular in shape while the horse ornaments are significantly oversized. Again he is one piece with his horse, although here a better job has been made of not losing too much detail, such as it is, from the rider. However you wouldn't really want to place him next to any of your Accurate or Italeri knights. Now we reach the early modern period, and the figures are getting a bit more recognisable. The infantryman is perhaps a musketeer from the 17th century (the thing on his hat is a feather, by the way), although detail is very sparse. The diamond-shaped device where his musket meets the rest is strange and we have no idea where that idea came from. The cavalryman, again practically a midget, is described as a dragoon. It is very hard to say, but he appears to be most like a British mounted infantryman of the later part of the 19th century. His helmet suggests the Zulu war or similar, although it has a crest on it. He carries a rifle, but there is no other detail from which an identification can be made. The modern era just has one figure - the cavalry is represented by a tiny tank, which is fair enough. Our lone foot soldier resembles a US soldier, perhaps of the Vietnam era. He wears a flak jacket and appears to be clutching an automatic rifle, but with so little detail it is probably not meant to be anything in particular. Like all the others his pose is reasonable, but whether he would be of much value to modellers is doubtful. In addition to the military units already described there are two further figures that are about the same scale. The first figure is labelled as a settler. Historical civilians are a rare event in this hobby, but we don't think this figure will be having much impact. He wears a curious kind of cap, a vest-style shirt and a kilt or skirt. He is bent forward under the weight of a sack he has on his back, and he is leaning on a large walking stick. We could not say what society he might fit into (he looks vaguely Mesoamerican), but he is not likely to be particularly useful. The other figure is more promising. He wears a long gown and holds a banner. In the game he is simply a marker identifying the owner of an army, but he could be of some use in many Arab or Chinese scenarios, and his flag could quite easily be substituted for something more appropriate for the intended use. 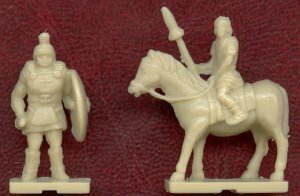 All the foot figures are true 1/72 scale, with the more modern figures being a little taller than the ancients, but the cavalry figures are significantly smaller. The proportions are quite reasonable, but the lack of most of the detail is a real problem, and there is a good deal of flash on some as well. 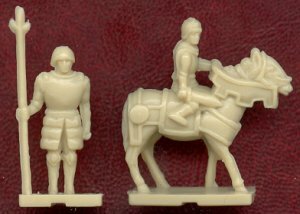 All the military figures come in the tan colour shown, and there are 32 of each foot figure and 24 of each cavalry figure in a game box. 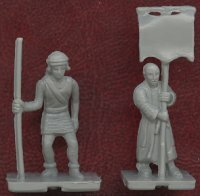 The two civilian figures come in six different colours (grey, yellow, red, purple, green and blue), and a game contains 14 flag bearers and 8 settlers in each colour. Happily you don't need to buy the whole game to get these figures - Eagle also sell bags of the figures separately. The question is, would you want to buy them? Well of course these are not meant to be accurate or attractive models, just game pieces, so this is not a criticism of their designer. However their very basic features means they are unlikely to be of much use to most modellers and gamers in our view. Still at least you now know what you would be getting if you did decide to buy these.